As expected, the best performances have come from the youngest where in the starting stages of chess pure talent rules and so even a small chess country like Malaysia is able to compete so big congratulations are in order for Under 8's Goh Jie Yi and Lye Lik Zang with a hope that in two years time they can maintain these results. Our relatively large talented group playing in the Under 10 also did well but other than 9 year old Tan Jun Ying, they will all have to compete as Under 12's next year and so will know that it will be challenge to keep progressing in terms of results as can be seen from the performances from those participating in that category this time around. 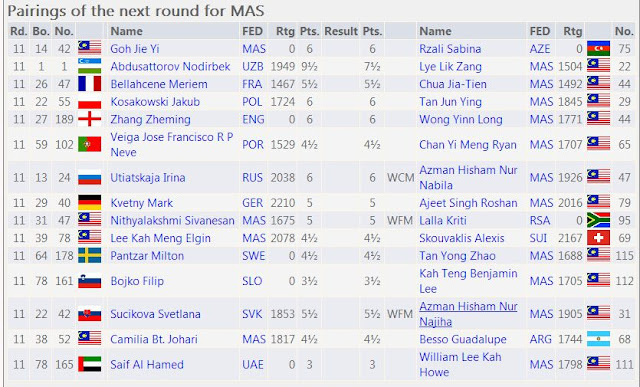 Nithyalakshmi Sivanesan in the Under 12 and Nur Najiha Azman Hisham and Camila Johari in the Under 14 played much to their ranking and so have not lost ground and that can also be said for 15 year old Under 16 representative Roshan Ajeet Singh and 16 year old Under 18 representative Elgin Lee Kah Meng but the question they will have to answer is if that is good enough for all five of them given their talent. Finally it must be said that the performance of the experienced Nur Nabila Azman Hisham in the Under 16 stands out, and when taking into account her performance at the recent World Chess Olympiad in Istanbul, Turkey, she should now be considered our current No. 1 women player. I wish all our young players playing in the WYCC 2012 all the best in the final round of a long and very demanding event... they have all done the best they could under various circumstances that even I who am here can only venture to guess at. They are some of the best young talent we have and all are playing very much to or above their initial ranking, and as we all know, last rounds are very much the luck of the draw affairs! I understand that MCF will be holding their elections at its coming Annual General Meeting and both I and KLCA will of course support everyone interested in holding office! After all it is a thankless job in the service of others. Strategies and plans for national development have to be made, communicated internally and externally while being promoted to media together with implementation, individually and collectively large amounts of time and effort need to be contributed for the real gritty on the ground work of such as liaison and coordination of activities with national players and member state affiliates, the various other national and international organisations, organising of major events, etc., and most importantly, for the funds to be found! Then there is the handling of the various necessary administrative matters pertinent to the running of a national sports organisation that is both a critical and a big responsibility, currently unpaid, and without hope of recognition or appreciation, let alone reward! With so many incumbents, most having held positions in MCF in one capacity or another for so long, I would not be surprised if many (or even all?) have finally decided to move on but if others wish to step up and offer their services I hope they will be able to quantify what that actually that is before seeking office is as everyone is equally qualified to talk, attend meetings, be "an expert" and accompany national teams abroad. I salute those, new or old, who would, as in the motto of my old college, be ready and prepared to "Serve to Lead"! 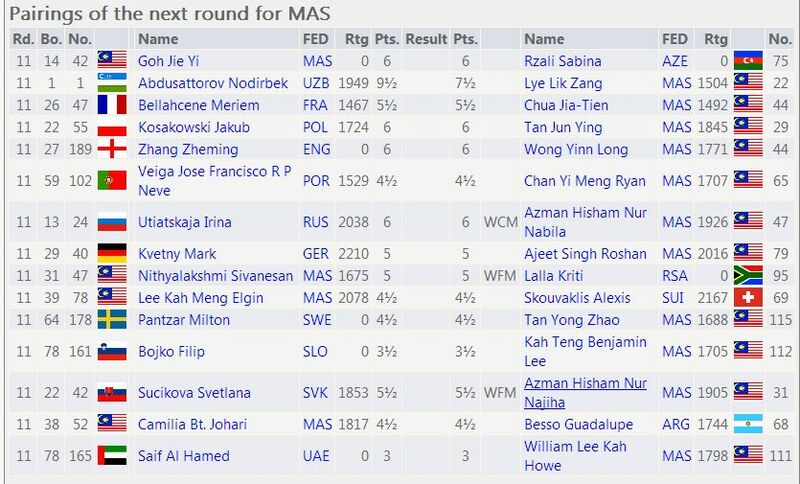 A snapshot of the results of the Malaysians in Round 6. There are a total of 11 rounds in the WYCC 2012 so this is the halfway point. 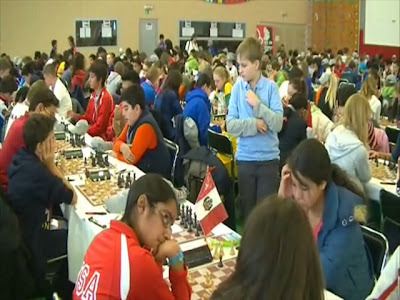 (For full details, see the official website at www.wycc2012.com and the results and pairings at www.chess-results.com). From yesterday, after the end of Round 3, the WYCC 2012 organisers have started sending us bulletins together with a file of 96 selected games and we are now getting bits and pieces of Round 4 even as Round 5 started this morning. With two games today before the rest day tomorrow it is certainly going to be a story of catch-up for them and I certainly don't envy those doing this work! As an organiser myself, albeit on much smaller scales,I am loath to criticise as I know something about the very real challenges - it is easy to talk but not quite so easy to do! - and I will say that to their credit, which each passing day it is clear that efforts are being made which are resulting in welcome improvements. From my good friend Vijay Kumar I have now managed, as can be seen, to get a photo of play in Round 3 and it is clear that conditions in this multi-purpose hall at the Dras Centre are a bit tight indeed other than at the top boards. He has also provided this link to the official video also posted at http://www.youtube.com/embed/F2aFfUOKJO8 which readers might find of interest. Today the rain has come and that is the weather forecast for the next few days. Our contingent is fully ready for this (or at least now are!) but let us hope there are no side effects or consequences to infrastructure as a result of possible heavy rainfall. But more importantly perhaps for some is that the day excursions paid for by all but 3 of our 32 strong group to Bled/Ljubjlana and to Postonja/Ljubjlana will not be ruined! Unfortunately I am among those unable to go (Mas has been attending the FIDE Trainer Seminar and one other member is off on his dream visit to Vienna) as Bled is a major tourist spot, with postcard perfect lake, island and castle while Postonja is highly recommended, a fantastic cave complex with a train ride. For both groups, lunch will be at the Slovenia's capital Ljubjlana followed by a city tour. 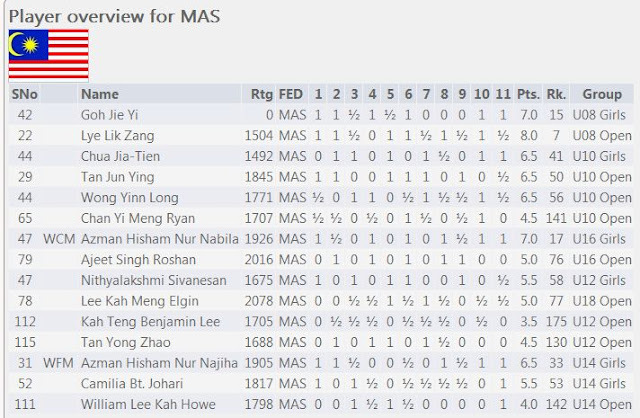 I have of course been looking at the games of the Malaysians playing here and especially in relation to their opponents and what I have seen only confirms my opinion that in an event such as the WYCC 2012, there are broadly three levels of play, Under 10, Under 14, and Under 18. At Under 10 level (7-10 years) we can compete because bright young children are all talented and generally speaking, any coaching, be it good or bad has not yet formed them and the need for having the appropriate competition is not yet been critical given their short time in chess. I think it is very clear that it is at this stage that all countries are able to closely contend! 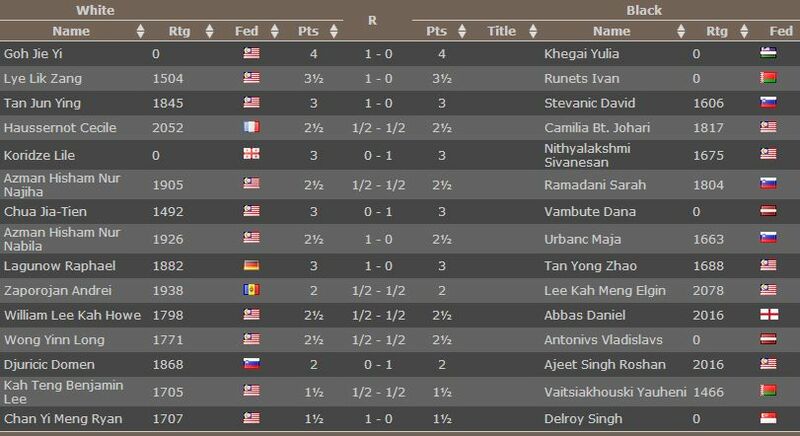 It becomes more complicated at Under 14 level (11-14 years) as talent can still be talked about but there seems to be a clear divide, not so much in terms of knowledge and experience, but in being able to properly apply the same in competition and I think that would be due largely to their getting an uneven chess education. Once reaching Under 18 level (15-18 years) there is not so much more that can be done if a player at that stage lacks the basics, be it theory (not just openings! ), capacity for work, or having sufficient high level competition, and this is especially apparent if he or she has not gotten the right guidance earlier. Today 16-18 year olds are IMs and GMs and in contention for places in their national teams. It is sadly a universal experience to see talents at Under 10 not reach anywhere their potential at Under 14. I am not especially referring to any of the Malaysian participants at the WYCC 2012 - they are as representative and as good as what we have. 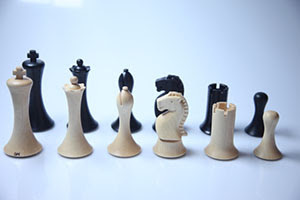 Just look around you as the local chess scene and also that of neighbouring countries, be it a Vietnam, Singapore, or Taiwan, have too many obvious examples which should not be named. I will say however with risk of offending that their success or failure is simply that of parent and child together but hope my frankness is mitigated by fully understanding and appreciating that is their absolute right! The Malaysian group to the World Youth Chess Championships traveled to Maribor, Slovenia from Penang and Kuala Lumpur via Singapore, Munich and Graz where we were met by the organisers and taken some 38 kilometers by bus over the border to our hotel. It was a very easy and pleasant trip overnight on Singapore Airlines and our hotel is the excellent Mlada Lipa which is a 20 minutes walk from the two tournament venues some 3.5 kilometers from the city centre. No baggage was lost, the hotel check in went smoothly as did the accreditation process. Maribor is a small town of some 100,000 people in a country with a total population of just 2,000,000 but is also the European Capital for Culture for 2012 and therefore very well set-up for tourism - for example our ID tags give us unlimited travel on a very good public transportation system and there are information points staffed by multilingual volunteers throughout a city that is a pleasure to walk about. We have settled into a routine with games at 3 p.m. daily. So breakfast is at 7.30-8 a.m. and then by 9 a.m. some players do a bit of preparation while mothers get together and bus to town for some two to three hours of sightseeing and shopping. Lunch is usually at 12.30 p.m. and most prefer to take a refreshing walk to the tournament hall around 2 p.m. So far the weather has remained relatively pleasant although it can be quite cold at night and few opt to walk back from 6-8 p.m. in the dark and wind when the games for the round and day generally finish. For the trainers (and most fathers who had baby sitting duties in the morning while their wives enjoyed the city), it is around 3.15 p.m. to 3.30 p.m. when the games have started and everyone has settled down that it is their turn to jump on the bus to enjoy an hour long stroll in the historical heart of the city. There are some frustrations of course, some unavoidable as a result of the organisers having some 2,800 players, parents and officials scattered in over 20 hotels located all over the city and having two separate and rather smallish tournament venues, but others have been unnecessarily caused by a certain inexperience and inflexibility regarding accommodating the realities of the challenges arising from having so many young children playing. But all in all everyone is happy and much of the credit has to go to the wonderful couple who run Mlada Lipa as they have gone out their way to make the Malaysians feel at home from cooking rice daily and making children friendly meals to getting hold of things like soya sauce! Furthermore Maribor and indeed all of Slovenia is inexpensive especially when compared to most of Europe and has the advantage of being an unspoiled and a very green, nature friendly country. 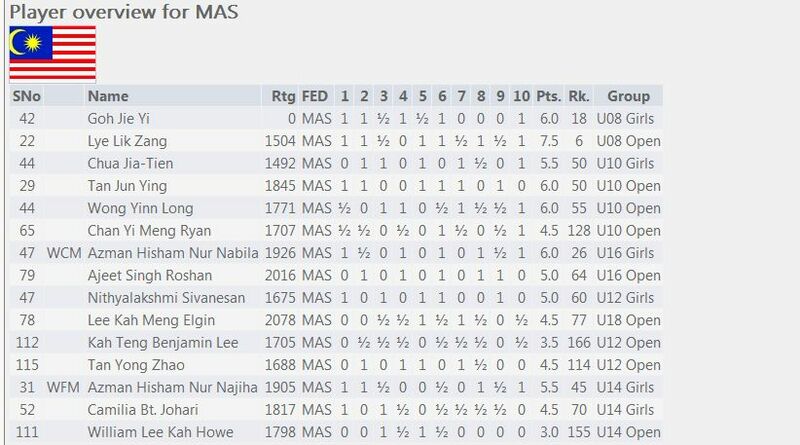 Today I officially agreed to be the Head of Delegation (HoD) for the Malaysian team of 15 players + 17 accompanying going to the World Youth Chess Championships. Frankly this is a responsibility I have no interest in - especially since my first and foremost obligation is to work with our young National Champion whose parents are paying for me to go - but as always, once I accept, I will do my best (and professionally too!) and I think all saw that at the Istanbul World Chess Olympiad. 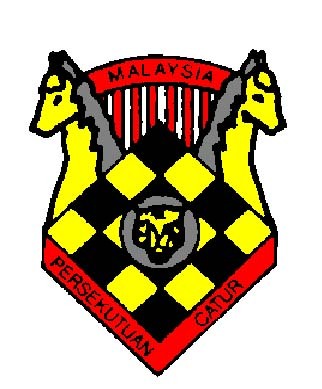 The Malaysian Chess Federation (MCF) of course understands that I am only agreeing to this in the absence of options available to them as this point due to various circumstances and I hope those going will also understand that I while I am experienced in these matters, on the details and in this very short time, I too am going to be learning! My role as I see it will be primarily to be the first point of contact between the Malaysian delegation and the organisers while we are in Slovenia, with my first task certainly being to facilitate a smooth check in at the hotel and getting us all the necessary accreditations. I will also be representing us at the technical meeting (probably my main qualification to be HoD!) and then will be calling a meeting to advise on the rules and regulations, tournament schedule, the do's and don'ts arising, and to inform of any pertinent matters impacting our participation. 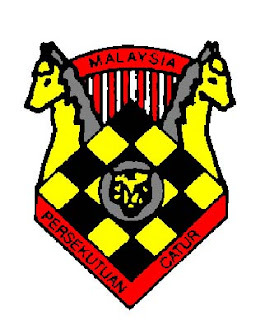 Although the Malaysian group are a mixture of official and guest players (and accompanying persons) with various levels of experience and exposure to such an event, there is a minimum level of obligation I will be expecting from all players since we are there under the MCF/Malaysia flag and so I will be communicating in no uncertain terms the standards of attire, matters of tardiness, of proper conduct, and the requirement for compulsory attendance at official functions. What I will not be doing is babysitting any players, as they, if not with parents, should have already designated guardians from the adults within the group, and I am definitely not going to be the coach of the 15 players! I am also certainly not responsible, let alone interested in addressing whatever might have transpired leading up to our arrival other than to ensure what has already been committed to by MCF and the group that goes there is fully respected by the organisers and that we will properly reciprocating their kindnesses. Finally I understand (but will be confirming there) that many going have plans to stay on or to visit other countries after the event but for those returning as scheduled I will certainly get them on to the plane home. MCF has told me that two of the parents going have kindly agreed to assist with day to day affairs of the group and of course when Mr Lee Ewe Ghee, a MCF Vice President arrives after a few days, he will be able to provide valuable and much needed support. Once final thing I wish to put on record is that all our roles at the World Youth Chess Championships, be it as player, parent, official or trainer, should be clear and so on my part that certainly does not including posting on my blog any reports, let alone commentary about the performance of the young players there especially while they are in competition. I take the view that unless you are a member of the press or have been engaged by official media to do this work you are not independent of what you are supposed to be doing there and it is almost certain that nothing good can come of a need to put your opinions about the play of others online.